**This story first ran on the Fine Books & Collections Blog on April 13th. Spring in Paris–is there anything better? Doubtful. The icing on the cake? Today through April 15, the Grand Palais hosts the Salon International du Livre Rare et de l’Objet d’Art. This year the Salon is backed by France’s UNESCO commission and presented by president Emmanuel Macron. (To be determined whether he is greeted by hecklers as he was at February’s Agricultural Fair.) **Update: It appears Macron skipped the show. ** The Salon has grown in scope and attendance over the past few years, and 20,000 visitors are expected to stroll the temple to Beaux-Arts architecture at the corners of General Eisenhower and Winston Churchill Avenues. This year’s special guests include the Institute for Contemporary Publishing Archives(IMEC) and the National Conservatory of Arts and Crafts (CNAM). IMEC specalizies in preserving archival collections at various publishing houses, while CNAM is a doctoral-degree granting program founded in the throes of the French Revolution. Both will be exhibiting materials culled from their respective archives. Among the fifty participants at this year’s salon is Solstices (16 rue Pestalozzi, Paris), a rare books dealer specializing in architecture, political posters, Russian art, and surrealism. And Laurent Coulet will be showing a major Proust find. 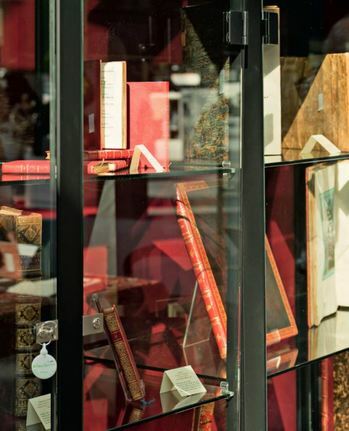 Museum exhibitions, paper-making demonstrations, and book signings round out this delightful cabinet of curiosities, and with a ten-euro entry fee, the Salon is well worth the price of admission. (Bouquinistes, students, Friends of the Louvre, and LILA booksellers are admitted free.) Bonne foire to all! Yet, the bouquinistes as we know them are in danger of turning into little more than trinket shops with matching roofs. Read all about it on the Fine Books Blog. Shiota exhibit at Savannah Museum of Art. Reproduced courtesy of Galerie Templon.